Do you get confused about where you can fish on the Eagle River in Colorado? If you answered yes then be confused no more. In Colorado landowners own the land to the middle of the stream bed. Landowners are not required to post their land private, nor are they required to put up fences. It is the responsibility of fishermen and hunters to know where they are at all times. Map the Xperience and Handy Map working with local area experts who have lived and fished the Eagle River for over 30+ years has created the finest digital GPS accurate map which features all public access areas, Forest Service Land, BLM Land, City/County public access, parking locations, campgrounds, boat launches, insect hatch charts, flyshop locations, float chart and more. Public fishermen access is shaded Green with private land shaded Red. Whats really cool about our digital GPS maps is that once they are downloaded into the free map app from Avenza you do not need any cell phone or Internet coverage for the maps to work. When you are in the maps extent a Blue GPS Dot will appear on the map marking your location. You can follow the Blue GPS Dot to your desired location. Lets take a quick tour of the Eagle River starting at its headwaters at Camp Hale. The Eagle River from it's headwaters near Camp Hale to it's confluence with the Colorado River in Dotsero is a patch work of Forest Service Land in its upper beginnings to Private Land, City/County Land and BLM Land in its lower reaches. The Eagle River begins it's journey at Camp Hale, between Red Cliff and Leadville in the Eagle River valley in Colorado. Camp Hale was a U.S. Army training facility constructed in 1942 for what became the 10th Mountain Division. It was named for General Irving Hale and was at an elevation of 9,200 feet (2,800 m) above sea level. Soldiers were trained in mountain climbing, Alpine and Nordic skiing, cold-weather survival as well as various weapons and ordnance. When it was in full operation, approximately 15,000 soldiers were housed there. The creation of an elite ski corps was a national effort, with assistance from the National Association of Ski Patrol, local ski clubs, and Hollywood. Enough men were recruited to create three army regiments, which were deployed after training. Camp Hale was decommissioned in November 1945. The upper Eagle River from Camp Hale downstream to Red Cliff is mostly accessible to the public on Forest Service Land. There are a few private sections along this stretch. One tip for fishermen is to park at the north end of Camp Hale and follow the river downstream along the train tracks into the canyon as the river plunges towards Red Cliff. This section of river rarely gets fished and offers the adventurous angler a chance to catch 10-12 inch Brown Trout on dry flies to your hearts content. As the Eagle River nears the town of Red Cliff it enters private land as you will see on our map. After flowing through Red Cliff the Eagle River enters Gilman Canyon a site of a former heavy metals mine. Avoid this private area. The next stretch of public land accessible to fishermen is at Tigiwon Road as the Eagle River flows out of Gilman Canyon and begins to run along Highway 6/24. There are numerous roadside pullouts from Tigiwon Road to just before Minturn providing anglers good access. The Eagle River through this stretch is predominately shallow with easy wading. Fishermen will find mostly small brown trout in the 10 to 12" range. In the town of Minturn the only public access is a short stretch of river at the park. Progressing to the north and west of Minturn, there is a County Road Bridge (marked on the map at mile marker 44) just prior to the Holy Cross Ranger Station and Dowd's Junction. Fishermen can driver across the bridge and park along the dirt road and fish upstream on either side of river. Expect to catch mostly 12 to 14" browns with an occasional rainbow. Moving further west we come into Dowd's Junction which is where Highway 6/24 goes under Interstate 70 for the first time and where Gore Creek enters the Eagle River. There are several roadside pullouts where fishermen can park. A bike path runs along the river here. The adventurous can actually go across the pedestrian bridge and walk downstream on the railroad tracks and then fish back upstream. Word of caution, the banks are steep so only do this at your own risk. Continue west down Highway 6 and we come to Eagle-Vail. Eagle-Vail has a number of business complexes located on the south side of the river. Located at the far west end of these business complexes is the Route 6 Cafe. In addition to being a great locals bar and restaurant, Route 6 is also a landmark for fishermen. Just past Route 6 as you head west is a dirt pull off area. (See Map, marked by a black dot just above mile marker 41). Fishermen can park here and walk down to river. You can fish the south side of the river downstream to just past the Eagle-Vail I-70 Bridge and upstream for about a 1/2 mile. Fishermen can also park under the Eagle-Vail I-70 Bridge. As we move further west we come to Avon and Bob the Bridge (See Map). Before discussing Avon, I need to mention the area of the River between Bob the Bridge and the Eagle-Vail I-70 Bridge. Below the Eagle-Vail I-70 Bridge the river runs through the Eagle Vail Golf Course. Technically this stretch is private property. However, fishermen do park at the Route 6 dirt parking spot reference above or under the Eagle-Vail I-70 Bridge and wade downstream in to the Golf Course section of the Eagle River. Be aware that you could take a golf ball to the head and that you must exit the river where you entered. Do not exit on the Golf Course. Below the Eagle Vail Golf Course to the west are a series of private homes and condominiums. As mentioned above, property owners immediately adjacent to the river own the stream bed to the middle of the river. Always know where you are. Heading west past the Eagle Vail Golf Course you will come to a round-about (traffic circle) which is Post Blvd. (See Map) Post Blvd goes to Walmart and Home Depot. Proceeding further west on Highway 6 you will see more private residences and condominiums. There is no access to the river until you come to Bob the Bridge in Avon. The next traffic circle (round-a-bout) heading west on Highway 6 is Avon Road. This marks the main entrance to Beaver Creek Ski Resort and Bob the Bridge. Bob the Bridge (Avon Road) crosses the Eagle River and is the main road in Avon connecting I-70 (Exit 167) and the Beaver Creek Ski Resort. Fishermen in the off season, (late April - Mid November) can park in the Elk Lot at the Beaver Creek Ski Resort and cross Highway 6 at the round-a-bout and then proceed to walk across the bike path over Bob the Bridge. Once across Bob the Bridge fishermen can follow the bike downstream on the north side of the river for one mile. This entire section of the river is public access except for a small section bordered by a fence and property of the Eagle River Water and Sanitation District. Heading west from Bob the Bridge is a stop light, the intersection of Highway 6 and West Beaver Creek Blvd. At this intersection is the Bear Lot, another parking lot for Beaver Creek Ski Resort. Fishermen during the off season (late April - Mid November) can park here and cross Highway 6 at the stop light and walk the bike path down West Beaver Creek Blvd to the river. When you come to the West Beaver Creek Blvd. Bridge the bike path heads west on the south side of the river and east on the north side of the river. Fishermen can follow the bike path to the west downstream for one mile on the south side of the river and fish back upstream. Fishermen can also fish upstream from the West Beaver Creek Blvd Bridge on the north side of the river by following the bike path one mile to Bob the Bridge. Located at the stoplight of West Beaver Creek Blvd. and Highway 6 is Fly Fishing Outfitters, an Orvis Endorsed Flyshop and Guide Service. Please stop by their shop if you are in the area. This is the best flyshop in the Vail Valley. The next public access heading west is the Eagle County Open Space (Miller Ranch) property. Heading west on Highway 6 from West Beaver Creek Blvd. you will come to a stop light at Miller Ranch Road. Turn on Miller Ranch Rd. and follow the bridge across the river. There used to be a dirt parking area just across the bridge, but that has been removed. Fishermen now park at the June Creek Elementary School and walk down to the river and then follow the dirt path east on the north side of the river. You can fish the north side of the river heading east for about one mile. The south side of the river is part of Arrowhead and is private property. Continuing west on Highway 6 we now come to Edwards. At the stop light is the Edwards Access Road. If you head north towards I-70 the road will cross the Eagle River. On the north side of the bridge is the Edwards Rest Area. This is a great place to park and for access. From the rest area you can fish both sides of the Eagle River upstream for about 1 mile until you get to a pedestrian bridge. Beyond the pedestrian bridge heading east is a condominium complex which is private. The next good size of public access heading further west down Highway 6 is the recently acquired Eagle River Preserve. Parking is found by pulling down the drive into the Preserve and is well marked. Next up headed west down Highway 6 is the Edwards Sanitation Plant located on Lake Creek Drive. Cross a bridge and then take a right on to Lake Creek Drive. The Edwards Sanitation Plant fishermen parking will be immediately on your right. This is the first major Boater Put In to float the Eagle River to Climbing Rock west of Wolcott. Evening dry fly fishing can be good in the slower water at this location. You can only fish from the bridge upstream on the north side of the river. Further west on Highway 6 is the Bellyache BLM Access. You will park just west of the I-70 Overpass. This is a small stretch of public water that gets fished heavily due to the easy access. Continue west to just before Wolcott to another BLM property called Ute Creek. Local guides refer to this area across from the Wolcott Post Office as “Raisin Run”. (See Map). Not more than a few miles west on Highway 6 and you notice a small blue camping sign which designates Climbing Rock BLM Area. This place offers camping, boating access and lots of river access. It is about one mile from where Highway 131 enters Highway 6 in Wolcott. Headed further west on Highway 6 is the new 400 acres of the historic Horn Ranch Open Space acquisition This recently approved public area boast’s 1.5 miles of river frontage along Highway 6 between Eagle and Wolcott. Obey all signage as a section of this is still private. About two more miles downstream to the west is the BLM Red Canyon Access marked by several large parking areas along the river. This scenic area is about a mile of north side only public access on BLM Land. Heading west on Highway 6 is the Eagle River State Wildlife Area where anglers will find several miles of fishing access on the north side of the river. Parking is along the road, found near the SWA signs and barbed wire cross over points. Moving a little further west is the town of Eagle. When you get to the round-a-bout at Highway 6 head north over the bridge crossing the Eagle River. Located just on the north and west side of the bridge are our good friends at Eagle River Anglers. Stop in and say hi to Bob. At the main round-a-bout in Eagle head west down a frontage road towards the Eagle County Fairgrounds access that appears on left just after arena complex as a dirt parking lot. Boating access and good amount of wading access awaits the fishermen in this county maintained public fishing area. The next public fishing access to the west is not for 6 miles in the town of Gypsum. When you arrive at the Gypsum traffic circle take the second right turn to the frontage road, follow the dirt road east one mile and it will lead you to a dead end in the Gypsum Ponds State Wildlife Area. Several miles of river and some recent stream/bank enhancement projects are part of this public access. Beware of the Mosquitoes. Bring your bug spray! Following Highway 6 down river from Gypsum you will see three gated BLM river access points that offer wade fishing. The one in the middle called Community Pit offers a primitive boat launch. The BLM has almost 6.7 miles of public access to the Eagle River, some of the areas offer camping and require fees, while others are free but designated for daily use. A few miles further west on Highway 6 is the newly acquired Duck Pond River Access 55 acres of public land with over 4,000 feet of Eagle River frontage which became a permanent conservation area on October 18, 2013. The land is owned by Eagle County and managed by Eagle County’s Open Space Department in partnership with the Colorado Division of Parks and Wildlife. Dotsero a little further west is known for having the state’s most recent volcanic activity about 500,000 years ago. At the Dotsero exit for a couple miles heading east you will see a dirt road heading south to the river directly after the lava flow disappears. This is a Bureau of Land Management (BLM) access the locals call the Lava Flow River Access. This area offers a primitive boat access and limited amount of wad-able water depending on the river levels. At Dotsero itself there is the Dotsero Landing Eagle County Open Space providing anglers with a small stretch of public fishing access and a Boat Ramp. 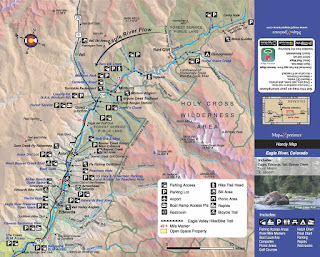 You can purchase the Eagle River Digital Mobile Map map direct from the Avenza PDF Map Store. Another way to purchase our digital maps is to first download and install the free Avenza PDF Map App. You can search Avenza in either your App Store or Google Play Store. Upon installing the Avenza PDF Map App, open the app and select the Maps Tab at the bottom. Click on the Maps Tab, then click on the + sign, then select From QR Code Reader. You can now scan this QR Code to purchase and download the digital map(s). The Eagle River Map is also available as a 15x11" water resistant paper foldout map that folds to 3x6" for easy carry in a pocket.